IL-12 has been shown to enhance cellular immunity in vitro and in vivo. Recent reports have suggested that combining DNA vaccine approach with immune stimulatory molecules delivered as genes may significantly enhance Ag-specific immune responses in vivo. In particular, IL-12 molecules could constitute an important addition to a herpes vaccine by amplifying specific immune responses. Here we investigate the utility of IL-12 cDNA as an adjuvant for a herpes simplex virus-2 (HSV-2) DNA vaccine in a mouse challenge model. Direct i.m. injection of IL-12 cDNA induced activation of resting immune cells in vivo. 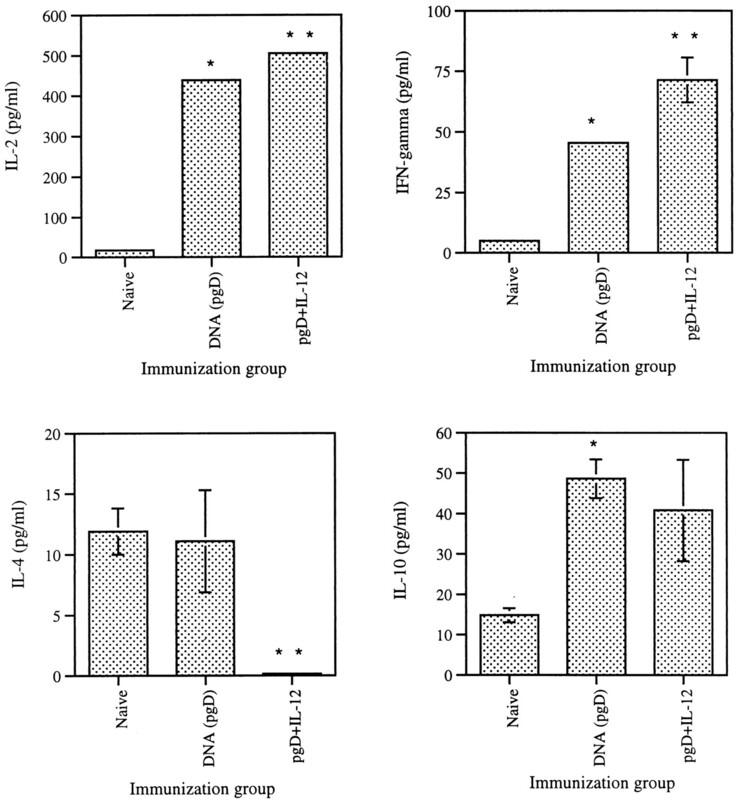 Furthermore, coinjection with IL-12 cDNA and gD DNA vaccine inhibited both systemic gD-specific Ab and local Ab levels compared with gD plasmid vaccination alone. In contrast, Th cell proliferative responses and secretion of cytokines (IL-2 and IFN-γ) and chemokines (RANTES and macrophage inflammatory protein-1α) were significantly increased by IL-12 coinjection. However, the production of cytokines (IL-4 and IL-10) and chemokine (MCP-1) was inhibited by IL-12 coinjection. IL-12 coinjection with a gD DNA vaccine showed significantly better protection from lethal HSV-2 challenge compared with gD DNA vaccination alone in both inbred and outbred mice. This enhanced protection appears to be mediated by CD4+ T cells, as determined by in vivo CD4+ T cell deletion. Thus, IL-12 cDNA as a DNA vaccine adjuvant drives Ag-specific Th1 type CD4+ T cell responses that result in reduced HSV-2-derived morbidity as well as mortality. Interleukin-12 is a heterodimeric cytokine consisting of two chains, p35 and p40. This cytokine is mainly produced by activated APCs, including macrophages, dendritic cells, and B cells 1, 2 . IL-12 induces Th1-type immune responses through inducing the maturation of type 1 Th cells from an uncommitted T cell pool. IL-12 also promotes NK activity and enhances CTL maturation 3 . Furthermore, IL-12 induces IFN-γ production by NK cells 2 . Several studies have reported that IL-12 as a protein has a critical role in inducing antiviral and antitumor effects in vivo. Direct administration of IL-12 protein or cDNA expressing IL-12 by gene gun can affect tumor progression and metastasis in animal models 4, 5, 6 . Similarly, therapeutic treatments with IL-12 protein can result in protective responses to some infectious viral agents, including vesicular stomatitis virus 7 , CMV 8 , and lymphocytic choriomeningitis virus 9 . Induction of IL-12 has also been related to viral clearance in chronic hepatitis B virus in humans 10 . Most recently, it has been reported that administration of IL-12 protein has some potential to treat lethal herpes simplex virus (HSV)3 infection in mice 11 . Furthermore, protective adjuvant effects of IL-12 protein coadministration have been observed in mouse bacterial infection models 12 . When used as a molecular adjuvant, IL-12 cDNA induces Ag-specific CTL responses with inhibitory effects on humoral responses in HIV DNA vaccine studies 13 . Iwasaki et al. 14 similarly reported that IL-12 cDNA codelivery with DNA immunogen encoding for influenza NP resulted in enhanced cellular immune responses. HSV-specific humoral and cellular immune responses have been suggested to be responsible for protective immunity against HSV infection. Recurrence of latent HSV has been linked to decreased cellular responses in the guinea pig model 15 . It has also been reported that adoptive transfer of HSV-specific T cells results in protecting animals from lethal HSV challenges 16 . Moreover, HSV-specific Th1 type CD4+ T cells have been reported to be responsible for protective immunity against intravaginal HSV challenge 17 . On the other hand, HSV-specific Abs, which are highly present in humans and mice, are insufficient to prevent central nervous system infection from HSV 18 . This suggests that cell-mediated immunity is directly related to inhibition of HSV replication and its spread to other tissues. Enhancement of therapeutic immune responses by cytokine gene delivery is an important goal of gene therapy for infectious diseases. Furthermore, there have been no HSV studies on the effect of DNA vaccines enhanced by IL-12 gene delivery and no infectious challenge studies. In this study we observed that injection of IL-12 cDNA can activate resting immune cells. When coinjected with a DNA vaccine, IL-12 cDNA drives protective immune responses to Ag-specific Th1-type CD4+ T cell-mediated types while inhibiting the generation of Ab responses. Lastly, IL-12 dosage studies in a herpes mouse model indicate that the dose ratio of DNA vaccine to adjuvants is a factor to be considered for induction of immune responses to and protection from viral infection. These results support the idea that IL-12 plasmid cytokine gene delivery can modulate immune responses to infectious agents in vivo. Female inbred BALB/c mice (4–6 wk) were purchased from Harlan Sprague-Dawley (Indianapolis, IN). Female outbred Swiss-Webster mice (6–7 wk) were purchased from Taconic Farms (Germantown, NY). Their care was performed under the guidelines of the National Institutes of Health (Bethesda, MD) and Institutional Animal Care and Use Committee-approved protocols. HSV-2 strain 186 (a gift from Dr. P. Schaffer, University of Pennsylvania, Philadelphia, PA) and HSV-2 strain 333 were propagated in the Vero cell line (American Type Culture Collection, Manassas, VA). DNA vaccine pgD (pAPL-gD2) encoding HSV-2 gD protein was previously described 19 . The expression vectors, pCDNA3-IL-12 p35, pCDNA3-IL-12 p40, and pCDNA3-GM-CSF were previously constructed in our laboratory. The procedures for their construction and expression have been previously described 13 . Plasmid DNA was produced in bacteria and was purified by double-banded CsCl preparations. Recombinant HSV-2 gD proteins, a gift from Drs. G. Cohen and R. Eisenberg (University of Pennsylvania), were used as recombinant Ag in these studies. The quadriceps muscles of BALB/c mice were injected with pgD constructs formulated in 100 μl of PBS and 0.25% bupivacaine-HCl (Sigma, St. Louis, MO) using a 28-gauge needle (Becton Dickinson, Franklin Lakes, NJ). The pCDNA3-IL-12 p35 and pCDNA-IL-12 p40 expression cassettes were mixed with pgD plasmid solution before injection. HSV-2 gD protein (0.75 μg/ml in PBS) was adsorbed onto 96-well microtiter plates. After blocking the plates for 1 h with blocking buffer (PBS, 0.05% Tween-X, and 2% BSA), 50 μl of diluted sera (1/100 in PBS) were added, and the plates were incubated at 37°C for 1 h. After addition of anti-murine IgG conjugated with horseradish peroxidase (HRP), the plates were incubated for 1 h at 37°C. For the determination of vaginal IgA levels, the vaginal route of each animal was washed with 200 μl of PBS, and then 50 μl of the washed solution was reacted with gD-2 protein in ELISA. For the determination of IgA levels, anti-murine IgA-HRP (Zymed, South San Francisco, CA) was substituted for anti-murine IgG-HRP (Sigma). For the determination of IgE levels, rat IgG (Zymed) raised against murine IgE and anti-rat IgG-HRP (Sigma) were substituted for anti-murine IgG-HRP. This was followed by addition of the ABTS (2,2′-azino-bis[3-ethylbenzenzthiazoline-6-sulfonic acid]) substrate solution (Chemicon, Temecula, CA). In each step, plates were washed three times with the wash buffer (PBS and 0.05% Tween-X). The plates were read on a Dynatech MR5000 plate reader with the OD at 405 nm. The ELISA titers were determined as the reverse of the highest serum dilution showing the same OD value as sera of naive mice. Spleens were aseptically removed from each group and pooled. Lymphocytes were harvested from spleens and prepared as the effector cells by removing the erythrocytes and by washing several times with fresh medium (RPMI 1640 supplemented with 10% FCS) as previously described 13 . The isolated cell suspensions were resuspended to a concentration of 1 × 106 cells/ml. A 100-μl aliquot containing 1 × 105 cells was immediately added to each well of a 96-well microtiter flat-bottom plate. HSV-2 gD protein at a final concentration of 1 and 5 μg/ml was added to wells in triplicate. The cells were incubated at 37°C in 5% CO2 for 3 days. One microcurie of tritiated thymidine was added to each well, and the cells were incubated for 12–18 h at 37°C. The plate was harvested, and the amount of incorporated tritiated thymidine was measured in a beta plate reader (Wallac, Turku, Finland). The stimulation index was determined from the formula: stimulation index = (experimental count − spontaneous count)/spontaneous count. Spontaneous count wells included 10% FCS, which served as an irrelevant protein control. To assure that cells were healthy, 5 μg/ml PHA (Sigma) was used as a polyclonal stimulator positive control. A 1-ml aliquot containing 6 × 106 splenocytes was added to wells of 24-well plates. Then, 1 μg of HSV-2 gD protein/ml was added to each well. After 2-day incubation at 37°C in 5% CO2, cell supernatants were secured and then used for detecting levels of IL-2, IL-4, IL-10, IFN-γ, RANTES, MCP-1, and MIP-1α using commercial cytokine kits (BioSource (Camarillo, CA) and R & D Systems (Minneapolis, MN) by adding the extracellular fluids to the cytokine- or chemokine-specific ELISA plates. Spleen cells (1 × 105) were washed three times with FACS buffer (PBS, 1% BSA, and 0.1% sodium azide) and then reacted with phycoerythrin-conjugated anti-mouse Ly-6A/E (PharMingen, San Diego, CA) for 30 min on ice. After washing three times with FACS buffer, cells were analyzed for the percentage of Ly6-positive cells on a flow cytometer (EPICS XL, Coulter, Hialeah, FL). One hundred microliters of anti-CD4 (clone GK1.5) ascites fluid (a gift from Dr. N. Chirmule of University of Pennsylvania) was administered i.p. on days −3, 0, and 3 of viral challenge. Ab treatment resulted in >98% depletion of specific CD4+ T cell subsets of representative animals over a 3-wk period. Depleted mice were subsequently challenged with virus on day 0. Three or five weeks after the last DNA injection, inbred BALB/c mice were challenged intravaginally with 4 × LD50 of HSV-2 strain 186 (1.4 × 104 plaque-forming units). Before inoculating the virus, the intravaginal area was swabbed with a cotton-tipped applicator (Hardwood Products, Guiford, ME) soaked with 0.1 M NaOH solution and then cleaned with dried cotton applicators. In the case of outbred Swiss-Webster mice, animals were challenged intravaginally with 3 × LD50 of HSV-2 strain 333 (5 × 105 plaque-forming units) after 21 days of DNA injection as described previously 20 . Mice were then examined daily to evaluate pathological conditions and survival rates. Statistical analysis was performed using paired Student’s t test and analysis of variance. Values between different immunization groups were compared. A p value <0.05 was considered significant. BALB/c mice have a few Ly6 resting peripheral lymphocytes, and IL-12 activation of immune cells leads to expression of Ly6 Ag 21, 22 . Therefore, Ly6 expression can be used as a marker of in vivo delivery of IL-12 genes. To determine whether IL-12 levels driven by our DNA vaccine cassettes can influence immune cell activation in vivo, expression levels of Ly6 on the splenocytes were detected using FACS analysis. Fig. 1⇓ shows that injection of 50 μg of IL-12 genes significantly increased the percentage of splenocytes expressing Ly6 to 24% on day 3. Ly6 expression levels peaked (32%) on day 6 and then continued to decline over the time period studied. By 60 days there was no difference between DNA-injected and negative control animals (7%). In contrast, injection of 0.1 μg of IL-12 genes had little effect on Ly6 expression on splenocytes. Therefore, the in vivo plasmid delivery of IL-12 can have a significant effect on cell activation status in vivo. Expression of Ly6 on splenocytes after IL-12 cDNA injection. Inbred mice (BALB/c) were injected with 0.1 and 50 μg of IL-12 cDNA. Negative control mice were injected with 50 μg of IL-12 backbone plasmid (pCDNA3). At various times, two mice per group were sacrificed, and spleens were pooled. The splenocytes obtained were stained with anti-Ly6 and tested by FACS analysis for the percentage of Ly6+ splenocytes. This represents one of three separate experiments showing similar results. To determine whether coinjection of gD genetic vaccines with IL-12 expression vectors might influence humoral immune responses against gD, sera and vaginal fluids obtained 2 wk after each DNA inoculation were tested in ELISA. As shown in Fig. 2⇓, gD DNA vaccine induced systemic gD-specific IgG, IgE, and IgA levels significantly higher than negative control values, whereas coinjection with IL-12 genes inhibited systemic gD-specific IgG, IgE, and IgA production significantly more than gD DNA vaccine. We also investigated inhibitory effects of IL-12 coinjection on Ab production over the time period (Fig. 3⇓). As shown in Fig. 3⇓A, gD DNA vaccine induced systemic gD-specific IgG levels significantly higher than negative control values, whereas coinjection with IL-12 significantly decreased the overall IgG levels. This inhibition of IgG production was more significant after an 8 wk booster injection with pgD and IL-12 genes. Since HSV-2 infects its host mucocutaneously, it is also important to measure levels of IgA in vaginal fluid. Fig. 3⇓B shows that gD DNA vaccine induced gD-specific intravaginal IgA levels. However, coinjection with IL-12 decreased the local anti-gD IgA levels, similar to the decrease observed in serum IgG levels. However, GM-CSF cDNA coinjection, used as a parallel positive control, enhanced systemic IgG and local IgA production significantly higher than gD DNA vaccine alone (data not shown). Levels of systemic gD-specific Ab (IgG, IgE, and IgA) in mice immunized with pgD vaccine and/or IL-12 cDNA. Each group of inbred BALB/c mice (n = 10) was immunized with 60 μg of pgD vaccines and/or 40 μg of IL-12 cDNA at 0 and 2 wk. Mice were bled 2 wk after the second immunization, and then equally pooled sera were diluted to 1/100 for reaction with gD. OD was measured at 405 nm. The assay was performed in triplicate. Values and bars represent the mean and SD. ∗, Statistically significant compared with the naive control at p < 0.05, using paired Student’s t test. ∗∗, Statistically significant compared with pgD vaccine alone at p < 0.05, using paired Student’s t test. Systemic anti-gD IgG levels after DNA immunization (A). Each group of inbred BALB/c mice (n = 12) was immunized with pgD vaccines (60 μg) and/or IL-12 cDNA (20 μg) at 0, 2, and 8 wk. Mice were bled biweekly, and then sera were diluted to 1/100 for reaction with gD. OD was measured at 405 nm. Values and bars represent mean (n = 12) and the SEM. Local anti-gD IgA levels after DNA immunization (B). Each group of inbred BALB/c mice (n = 12) was immunized with pgD vaccines (60 μg) and/or IL-12 cDNA (20 μg) at 0, 2, and 8 wk. After 2 wk of the third DNA vaccination, the vaginal route was washed with PBS and then tested for vaginal IgA levels in ELISA. OD was measured at 405 nm. Values and bars represent the mean (n = 12) and SD. ∗, Statistically significant compared with the naive control at p < 0.05, using paired Student’s t test. ∗∗, Statistically significant compared with pgD vaccine alone at p < 0.05, using paired Student’s t test. Th cells play an important role in eliciting both humoral and cellular immune responses via expansion of Ag-stimulated B cells and expansion of CD8+ T cells, respectively. As a specific indicator of CD4 activation, T cell proliferation was examined. The gD-2 protein (1 and 5 μg/ml) was used for Ag-specific stimulation of T cells. For a positive control, 5 μg/ml PHA was used as a polyclonal stimulator. As shown in Fig. 4⇓, a low background level of Th cell proliferation was observed in negative controls. However, gD DNA vaccine-stimulated cells had an enhanced Th cell proliferative response. When coinjected with IL-12 genes, Th cell proliferation levels were further increased compared with the effect of gD DNA vaccine alone. Th cell proliferation levels after in vitro stimulation with gD proteins. Each group of mice (n = 2) was immunized with 60 μg of pgD vaccines and/or 40 μg of IL-12 cDNA at 0 and 2 wk. Two weeks after the last DNA injection, two mice were sacrificed, and spleen cells were pooled. 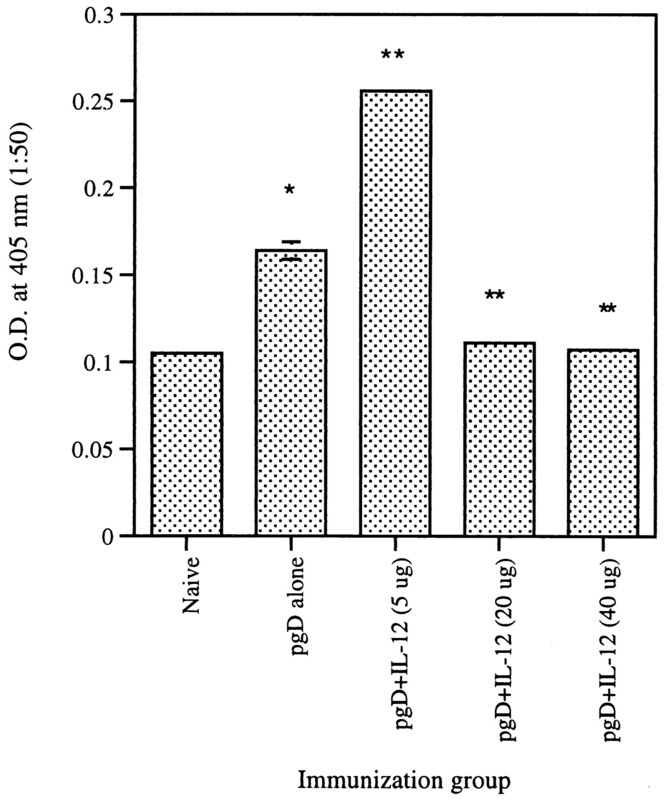 Splenocytes were then stimulated with 1 and 5 μg/ml gD-2 proteins and with 5 μg/ml PHA as a positive control. After 3-day stimulation, cells were harvested, and counts per minute were determined. Samples were assayed in triplicate. The PHA control sample showed a stimulation index of 50–60. This was repeated at least three times with the expected results. ∗, Statistically significant compared with the naive control at p < 0.05, using paired Student’s t test. ∗∗, Statistically significant compared with pgD vaccine alone at p < 0.05, using paired Student’s t test. Th1 cytokines (IL-2 and IFN-γ) and Th2 cytokines (IL-4, IL-5, and IL-10) are major parameters in our understanding of the polarization of immune responses. Th1 immune responses are thought to drive induction of cellular immunity, whereas Th2 immune responses preferentially drive humoral immunity. We examined the effects of coinjection of gD DNA vaccine with and without IL-12 genes on Th1 or Th2 phenotypic change. As shown in Fig. 5⇓, IL-2, IL-10, and IFN-γ production was increased by the gD DNA vaccine compared with negative control values. In contrast, IL-4 levels were unaffected by the gD DNA vaccine. When coinjected with IL-12 genes, IL-2 and IFN-γ production was further boosted. 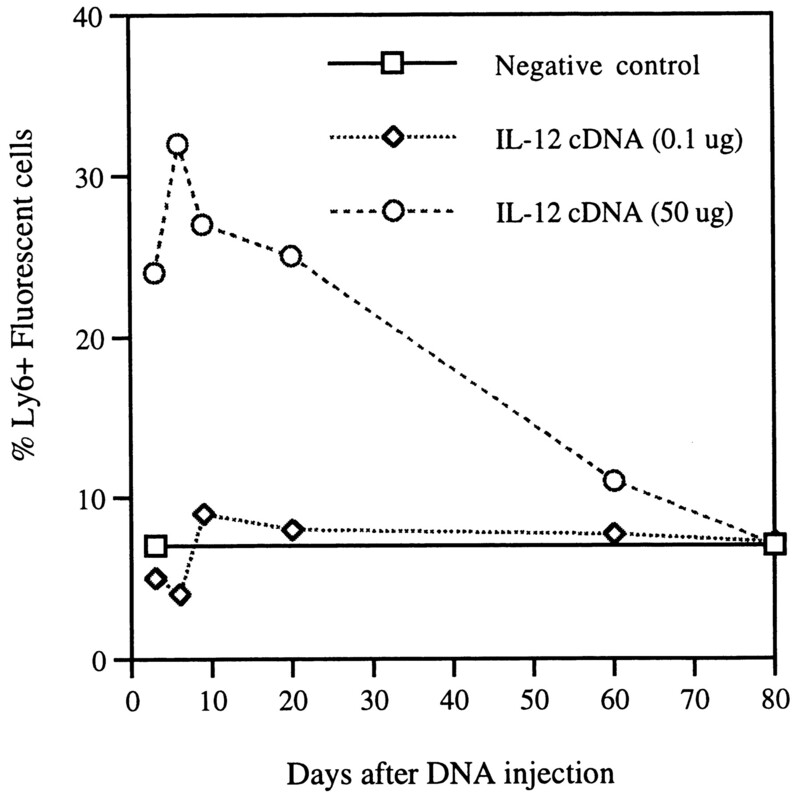 In contrast, IL-4 and IL-10 production was decreased by IL-12 coinjection. Production levels of IL-2, IL-4, IL-10, and IFN-γ from splenocytes in mice immunized with pgD and/or IL-12 cDNA. Each group of mice (n = 2) was immunized with 60 μg of pgD vaccines and/or 40 μg of IL-12 cDNA at 0 and 2 wk. Two weeks after the last DNA injection, two mice were sacrificed, and spleen cells were pooled. 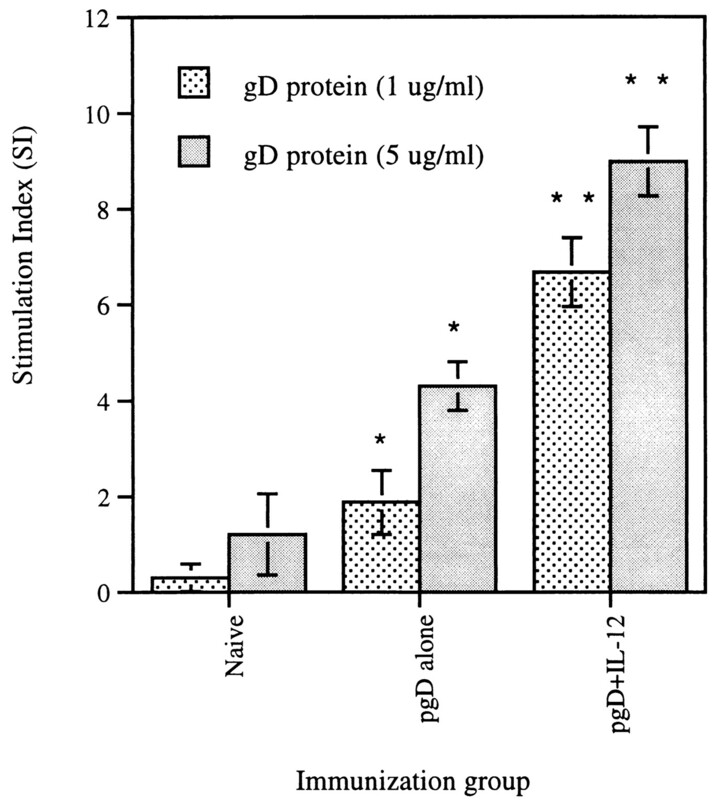 Splenocytes were stimulated with 1 μg of gD-2 proteins/ml for 2 days. Samples were assayed in triplicate. Values and bars represent the mean of released cytokine concentrations and SD. This was repeated at least three times with the expected results. ∗, Statistically significant compared with the naive control at p < 0.05, using paired Student’s t test. ∗∗, Statistically significant compared with pgD vaccine alone at p < 0.05, using paired Student’s t test. Production levels of RANTES, MIP-1α, and MCP-1 from splenocytes in mice immunized with pgD and/or IL-12 genes. Each group of mice (n = 2) was immunized with 60 μg of pgD vaccines and/or 40 μg of IL-12 cDNA at 0 and 2 wk. Two weeks after the last DNA injection, two mice were sacrificed, and spleen cells were pooled. Splenocytes were stimulated with 1 μg of gD-2 protein/ml for 2 days. Samples were assayed in triplicate. Values and bars represent the mean of released chemokine concentrations and the SD. This was repeated at least three times with the expected results. ∗, Statistically significant compared with the naive control at p < 0.05, using paired Student’s t test. ∗∗, Statistically significant compared with pgD vaccine alone at p < 0.05, using paired Student’s t test. Inbred mice (BALB/c) surviving after challenge with 4 × LD50 of HSV-2 (186) were followed for 1 mo postchallenge to examine pathological symptoms. Herpetic lesions were observed on the epithelial layers of the skin around the vaginal area. As shown in Table I⇓, immunization with gD DNA vaccine alone resulted in more mice showing herpetic lesions than those that received the pgD and IL-12 immunization. Furthermore, coinjection with IL-12 genes resulted in complete healing of lesions in all surviving animals 19 days after viral challenge. Animals vaccinated with gD DNA vaccine alone failed to recover from their lesions even 21 days after viral challenge. The herpetic lesions were scored based upon their severity. As shown in Fig. 7⇓A, coinjection with IL-12 genes induced a significantly lower degree of severity in herpetic lesions compared with gD DNA vaccine alone. Severity of herpetic lesions in inbred mice (A) and outbred mice (B) after HSV-2 infection. A, Each group of inbred BALB/c mice (n = 10) was immunized with pgD vaccines (60 μg) and/or IL-12 genes (20 μg) at 0, 2, and 8 wk. Three weeks after the last DNA injection, mice were challenged intravaginally with 4 × LD50 of HSV-2 (186). Mice were then checked every day after viral challenge to observe the pathological symptoms. Degrees of severity of herpetic lesions were recorded as tiny lesions (1+), mild to less severe lesions (2+), and severe lesions (3+). Values and bars represent the mean degrees of severity and SD, respectively. B, Each group of outbred Swiss-Webster mice (n = 10) was immunized with pgD vaccines (30 μg) and/or IL-12 genes (50 μg). As a negative plasmid control, pgD backbone plasmid pAPL-1 (30 μg) was also injected. Twenty-one days after the initial immunization, mice were challenged intravaginally with 3 × LD50 of HSV-2 (333). Mice were checked every day after viral challenge to observe the pathological symptoms. Degrees of severity of herpetic lesions were recorded as no inflammation (0), mild inflammation-local erythema (1+), moderate inflammation-hair loss or barbering (2+), marked inflammation-urinary inconsistence or sore and open wounds (3+), and hind limb paralysis, systemic illness (scruffy), spontaneous death, euthanasia (4+). Values represent the mean of degrees of severity. ∗, Statistically significant compared with the negative control at p < 0.05, using paired Student’s t test. ∗∗, Statistically significant compared with the negative control and IL-12 gene alone at p < 0.05, using paired Student’s t test. Outbred mice (Swiss-Webster) immunized with gD DNA vaccine were also challenged with 3 × LD50 of HSV-2 (333), observed for 21 days after challenge, and scored for pathological symptoms. As shown in Table I⇑, immunization with gD DNA vaccine alone reduced the number of mice showing herpetic lesions compared with the effect of negative plasmid control or IL-12 cDNA alone. However, coinjection with IL-12 cDNA significantly reduced the number of mice with lesions over the time period. Fig. 7⇑B shows that injection of IL-12 genes alone reduced morbidity scores slightly lower than negative plasmid controls. When immunized with gD DNA vaccine alone, the morbidity score was significantly reduced over the time period studied compared with that in negative control animals or IL-12-injected animals. When coinjected with pgD plus IL-12 genes, the morbidity score was the most significantly decreased. To determine whether coinjection with a different dose of IL-12 genes influences systemic IgG levels in vivo, mice were coimmunized with IL-12 genes ranging from 5–40 μg/mouse, and then sera obtained 4 wk after DNA inoculation were tested in ELISA. As shown in Fig. 8⇓, gD-specific IgG levels were induced significantly by coinjection with 5 μg of IL-12 genes. However, when coinjected with 20 or 40 μg of IL-12 genes, gD-specific IgG levels were completely inhibited to levels of negative controls. ELISA titers of equally pooled sera of pgD alone (6 μg), pgD plus IL-12 (5 μg), pgD plus IL-12 (20 μg), and pgD plus IL-12 (40 μg) were also determined to be 160, 320, 40, and 40, respectively. The pCDNA3 has been routinely used as a negative control and had no effect on ELISA titer, while a positive control (GM-CSF plasmid) increased the titer (data not shown). To determine whether coinjection with a different dose of IL-12 genes influences the survival of animals after lethal challenge with HSV-2 (186), inbred animals were challenged with 4 × LD50 5 wk after the initial immunization. As shown in Fig. 9⇓A, naive mice succumbed to death within 13 days after viral challenge. However, gD DNA vaccine (6 μg) alone increased the survival of mice to 60%. Furthermore, coinjection with 5 and 40 μg of IL-12 genes increased the survival of mice to 88 and 80%, respectively. In contrast, coinjection with 20 μg of IL-12 genes resulted in complete protection from lethal herpetic infection. These data are supportive of dose-response effects mediated by local cytokine production. Fig. 9⇓B and Table I⇑ also show protective effects of IL-12 genes on HSV-2 challenge in outbred mice. Mice injected with either pgD backbone plasmids (pAPL-1) or IL-12 genes (50 μg) displayed 22 and 40% survival of mice, respectively. However, gD DNA vaccine alone showed 90% survival of mice 20 days following viral infection, but the survival rate was decreased to 70% thereafter. Furthermore, complete protection from HSV-2 challenge was observed by coinjecting IL-12 genes (50 μg). Effects of IL-12 and its doses on mortality in inbred (A) and outbred (B) mice after HSV-2 infection. In inbred BALB/c mice, 8–10 mice/group were immunized with pgD vaccines (6 μg) and/or IL-12 genes (5, 20, and 40 μg). Five weeks after this single DNA immunization, mice were challenged intravaginally with 4 × LD50 of HSV-2 (186) and then checked for 30 days to determine survival rates. In outbred Swiss-Webster mice, 9–10 mice/group were immunized with pgD vaccines (30 μg) and/or IL-12 genes (50 μg). As a negative plasmid control, pgD backbone plasmid pAPL-1 (30 μg) was also injected. Twenty-one days after this single immunization, mice were challenged intravaginally with 3 × LD50 of HSV-2 (333) and then checked for 21 days to determine survival rates. ∗, Statistically significant compared with the naive control, negative plasmid control, or IL-12 genes alone at p < 0.05, using ANOVA. ∗∗, Statistically significant compared with pgD vaccine alone at p < 0.05, using ANOVA. It has been reported that Th1-type CD4+ T cells, but not CD8+ T cells, are responsible for protecting animals from HSV challenge 17, 26, 27 . In our studies we also investigated the induction of gD-specific CTL responses by gD DNA vaccination, but no CTL activity was observed. Furthermore, no CTL data have been reported after immunization with gD DNA vaccine 19, 28, 29 . Thus, we next focused on possible roles of CD4+ T cells in inducing IL-12-enhanced protective immunity against viral infection. As shown in Fig. 10⇓, all animals immunized with pgD plus IL-12 survived lethal HSV challenge. However, vaccinated animals treated with anti-CD4 Abs failed to survive lethal challenge in a manner similar to control animals. The data support the idea that IL-12 can enhance survival through effects on CD4+ T cells. In vivo depletion of CD4+ T cells and protective immunity against HSV challenge. Each group of inbred BALB/c mice (n = 6) was immunized with pgD vaccine (30 μg) plus IL-12 cDNA (20 μg). Three weeks following the initial DNA immunization, one group of mice was administered i.p. 100 μl of anti-CD4 (clone GK1.5) ascites fluid on days −3, 0, and 3 of viral challenge. Mice were subsequently challenged intravaginally with 4 × LD50 of HSV-2 (186) and then checked for 14 days to determine survival rates. ∗, Statistically significant compared with the naive control and DNA immunized but anti-CD4 Ab-treated mice at p < 0.05, using ANOVA. In HSV infection, preventing HSV-derived morbidity has been a main focus of both vaccine design and drug therapy. HSV-2 infects mucocutaneously and causes genital infection in humans 30 . After viral infection, the virus establishes latency in the sensory ganglia 30, 31 . Since recent subunit vaccination has not been clinically demonstrated to prevent recurrent HSV infection, additional approaches should be developed and studied for both prophylactic and therapeutic vaccines against HSV. In animal models, some HSV glycoproteins and DNA vaccines expressing viral components have been shown to provide protection against lethal and recurrent viral infection 17, 28, 29, 32, 33, 34, 35, 36 . DNA vaccination has been shown to induce both humoral and cellular immune responses to Ags of interest and then confer protective immunity against certain viral pathogens in animal models 17, 37, 38, 39, 40, 41 . Furthermore, in DNA vaccination studies a variety of cytokine genes have been applied to induce better protective immunity against viral infection. For example, GM-CSF genes when coinjected with DNA vaccines increased survival in both a rabies mouse model as well as an encephalomyocarditis virus mouse model 39, 42 . A number of studies have reported enhancement of cellular or humoral responses after cytokine codelivery 13, 43, 44, 45 . In particular, coinjection of IL-12 cDNA enhances Ag-specific T cell proliferation responses and CTL activities in DNA vaccine studies 13, 14 . However, these collective studies did not demonstrate what effects if any such vaccination would have in any pathogenic challenge. Furthermore, it would not be surprising if different pathogens would behave uniquely due to different immune correlates. In the present study we observed significant enhancement of protective cell-mediated immune responses with regard to the HSV model when combining a DNA vaccine for gD with the IL-12 cDNAs. Direct i.m. injection of IL-12 genes resulted in increased expression of the Ly6 molecule on splenocytes. Furthermore, IL-12-mediated effects on Ly6 expression were observed up to 80 days after DNA injection. This suggests that IL-12 molecules are continuously produced by i.m. injection of IL-12 cDNA, resulting in activating resting immune cells in vivo. However, significant inhibition of gD-specific Ab (systemic IgG, IgA, IgE, and local IgA) production was observed through vaccine modulation by codelivery with IL-12 genes. This is compatible with the previous finding that coinjection with IL-12 molecules showed a significant inhibition of IgG responses to a viral DNA vaccine 13 . In contrast, increased Th cell proliferation was achieved by coinjecting plasmid DNAs encoding IL-12. This is again compatible with the previous finding that coinjection with IL-12 molecules increases Ag-specific Th cell proliferation 13 . This pattern is in line with cytokine production levels showing that coinjection with IL-12 cDNA enhanced both IL-2 and IFN-γ secretion but inhibited IL-4 production. This implies that IL-12 gene delivery was capable of activating T cells that generate Th1-type cytokines (IL-2 and IFN-γ) but inactivate T cells secreting Th2-type cytokines (IL-4). Similarly, IL-12 coinjection appears to be inhibitory to the production of Th2-type cytokine (IL-10). Moreover, Th1 cell-mediated ocular inflammatory disease by HSV infection was suppressed by topical administration of IL-10 protein, resulting from suppressed chemokine production 46 . The disease (inflammation in the eye) was also ameliorated by injection with anti-MIP-1α, but not anti-MCP-1, indicating that MIP-1α might be related to induction of Th1 type cell-mediated immune responses. In our study we also observed that IL-12 coinjection enhanced the production of RANTES and MIP-1α, but not MCP-1, from splenocytes after in vitro stimulation with gD. This indicates that RANTES and MIP-1α might be involved in the induction of strong Th1-type cellular immune responses 47 . In these cases this activity cannot be ascribed to backbone CpG motifs, as mixing of gD plasmids with pCDNA3 vector did not demonstrate similar immune modulatory function or a change in challenge outcome (data not shown). Thus, the application of IL-12 cDNA in DNA vaccine studies appears to be warranted for inducing Ag-specific Th1-type cell-mediated immune responses. It has been reported that humoral, cellular, or both immune responses could be responsible for protective immunity against HSV infection 31, 48 . During viral infection, neutralizing Abs can inactivate free viral particles, but are not able to inhibit intracellular HSV infection 49 . When immunized passively with anti-HSV serum, an inhibition of local viral replication was observed in T cell-depleted animals 50 . It appears that Ab-dependent, complement-mediated, and Ab-dependent cell-mediated cytotoxicity are involved in the prevention of HSV infection 49, 51, 52, 53 . Furthermore, it has been suggested that HSV-specific cellular-mediated immunity may play an important major effector function to eradicate HSV-infected cells and control recurrent HSV infection 16, 49, 54, 55 . We observed that IL-12 cDNA injection alone showed a minor beneficial effect on both mortality and morbidity resulting from HSV-2 infection. Further coinjection of pgD and IL-12 significantly induced protection from morbidity in both inbred and outbred mice. Furthermore, less herpetic lesions and faster recovery from the herpetic lesions were achieved by coinjecting IL-12 cDNA with gD Ag in both inbred and outbred mice. In the case of mortality, coinjection with IL-12 genes (50 μg) significantly enhanced survival rates of mice after HSV infection in outbred mice compared with the effect of injecion of the negative plasmid control and the IL-12 gene alone. This is also compatible with our results of inbred mouse challenge studies showing that coinjection with different doses of IL-12 cDNA (5, 20, and 40 μg/chain) all enhanced the survival of mice compared with gD DNA vaccine alone. In particular, coinjection with IL-12 cDNA (20 μg/chain) alone resulted in complete protection from lethal HSV-2 challenge. At the 20-μg dose of IL-12, gD-specific IgG levels were completely inhibited. This indicates that cell-mediated immune responses are mainly involved in reducing mortality and morbidity resulting from HSV infection. This also suggests that the concentration ratio of DNA vaccines to adjuvants is a factor to be considered for IL-12 adjuvancy in a herpes mouse model and possibly other viral infection models. It seems likely that a lower concentration ratio of DNA vaccine to adjuvant tends to reduce the generation of vaccine-specific immunity mediated by surplus adjuvants. Taken together, it seems that there is a positive correlation between protective immunity and cellular immunity, which is explained by increased Th cell proliferation responses and cytokine (IL-2 and IFN-γ) production levels when coinjected with IL-12 molecules. Our observation of enhanced cell-mediated immune responses is supported by previous findings that coinjection with IL-12 cDNA has a potent effect on the induction of Th cell proliferation and CTL activity in HIV and influenza DNA vaccine studies 13, 14 . Recently, it has been reported that Th1-type CD4+ T cells, but not CD8+ T cells, are responsible for protecting animals from HSV challenge 17, 26, 27 . In our studies, we also investigated the induction of gD-specific CTL responses by gD DNA vaccination, but no CTL activity was observed by us here (data not shown), which is consistent with previous findings 19, 28, 29 . These other studies suggested that gD might not possess a CTL epitope in this particular haplotype. This suggests that the protective effect of IL-12 genes is dependent on CD4+ T cell-mediated immunity. We directly confirmed this hypothesis through in vivo deletion of the CD4+ T cell subset using anti-CD4 Ab treatment of mice. In vivo CD4 deletion suppressed the IL-12-enhanced protective immunity against HSV challenge. We also observed that coinjection with IL-12 cDNA increased IFN-γ production in vitro. IFN-γ plays a critical role in host resistance directly or via induction of an anti-HSV state in lymphocytes and macrophages 56, 57, 58, 59, 60, 61 . Taken together, it seems that protective effects of IL-12 gene coinjection might be to stimulate a more Th1-type CD4+ T cell. In conclusion, the data presented here suggest that IL-12-induced cellular immune responses, in particular Th1-type CD4+ T cell-mediated responses, mediate enhanced protection from mortality and morbidity against lethal HSV-2 challenge in gD DNA vaccine studies. Moreover, better protection could be achieved by injecting both DNA vaccine and IL-12 cDNA at the proper concentration, suggesting that the dosage between vaccine and IL-12 is a factor to be considered in DNA vaccine trials. These studies also demonstrate that molecular adjuvants can increase both the potency and the focus of vaccine preparations, indicating the need for additional study of such multicomponent preparations for both vaccine and immune therapeutic applications. We thank Drs. G. Cohen and R. Eisenberg for providing HSV-1, 2 gD (306t). We also thank Drs. P. Schaffer and R. Jordan for providing a stock of HSV-2 for this study. The generous gift of anti-CD4 ascites fluid from Dr. N. Chirmule is appreciated. J. I. Sin thanks Dr. S. Specter for his advice on this study. ↵1 D.B.W. was supported in part by grants from the National Institutes of Health. ↵3 Abbreviations used in this paper: HSV, herpes simplex virus; GM-CSF, granulocyte macrophage CSF; HRP, horseradish peroxidase; MCP-1, monocyte chemotactic protein-1; MIP-1α, macrophage inflammatory protein-1α; LD50, half-maximal lethal dose. Nahmias, A. J., J. Dannenbarger, C. Wickliffe, J. Muther. 1980. Clinical Aspects of Infection with Herpes Simplex Virus 1 and 2 Elsevier, New York.